Cooking is fun, especially when you are cooking your favorite meals outdoors with your family and friends. We all dream of having a house that has a spacious backyard or roof where we can set up a barbecue and enjoy scrumptious delicacies anytime, but it is not possible. However, there is no need to feel sad thinking about things you don’t have. You should instead arrange a small barbecue in whatever space you have. In order to make your own in-house barbecue a reality, you can go check out the best small propane grills that are available on the market. Grill manufacturers too have noticed the need for manufacturing small grills because there was a completely new market available to be captured. Now, the market is flooded with small grills that run on propane and serve the purpose of users, i.e., cooking delicious smoky delights in the most suitable way. Let’s check out the features of this unit. The Road Trip series of Coleman begins with this particular grill. In a nutshell, it is a very affordable unit, which is packed with dozens of features, thus making one of the most versatile portable grills on the market. Coleman has astutely amalgamated the best cooking features in a compact unit with a competitive price tag so that it becomes hard for users to select any other grill over it. This grill is ideal for RV camping, tailgating, and picnics. The ability to cook meals in different styles at a time makes this grill a perfect choice for those who want a variety in their meals. You can sauté onions on one side of the grill using a griddle plate and grill steaks on another side using cast-iron grill grate. Similarly, you can cook bacon and pancakes simultaneously without worrying about the grease that is released from the bacon coming on the pancakes. Many different and unique combinations can be tried on the grill. Although it is marketed as a portable grill, the size of the grill tells a different story. The cooking area of the grill is 285 square inches and the entire unit is 24 inches wide and 12 inches deep. Despite its big size, the grill can be easily moved from one place to another, as many of its parts can be folded down. With a pair of reliable wheels and an extendable handle, you can easily move this grill. Top quality steel construction along with high-heat painted surface will keep the unit in a working condition for a long time. Under the burner knobs, you will find three tool hooks, which you can use to hang BBQ fork, tongs, and spatula. A side table is located on each side of the grill, which can be used to hold jars, bottles and more. You can set different temperatures on both burners in order to make different meals at a time. Clean and tidy operation as the grill incorporates a metal grease trap at the bottom to catch drippings. Cast iron grates are porcelain coated, so you will get a perfectly seared food, plus you’ll have to spend lesser time in cleaning the grates. The placement of the LP bottle holder and regulator depicts the smartness of the company, as both can be accessed easily. The heat capacity of the grill is 20,000 BTUs, so you can expect faster cooking in this grill. Fuel is used to its full potential, so less wastage of fuel. Large cooking area means more cooked food at a time. Wheels make transporting the grill a charm. Grease trap can be very messy and so does its cleaning. The grill is susceptible to rust. Cleaning the grill is anything but easy. It may be hard for newbies to cook on this unit due to its significant heat output. 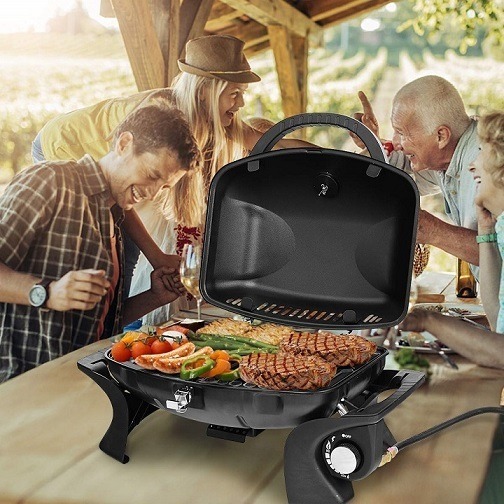 Get your grilling game on with this amazing portable propane grill (our reviews: this is the best portable propane grill) that has a cooking surface of about 225 square inches and heat capacity of 11,000 BTUs, so you can cook a lot of food in a less amount of time with this grill. The collapsible, wheeled stand lets you take the grill to anywhere you want without putting in much effort. When you reach the spot where you will be barbecuing, just use the lift and lock system to easily set up the grill. Matchless lighting and a high heat capacity make cooking fun. Let’s delve into some of the amazing features of the grill to have a better idea of the product. A solid stainless steel construction with porcelain enameled cast iron grates assures that you get the meal you were looking to have in the first place. Matchless lighting makes it easier to ignite the unit. A spacious cooking area of 225 square inches in the grill ensures that more food is cooked at a time. The heat generation capacity of the grill is 11,000 BTUs, which is good, but lesser than other portable propane grills. Get more control over the cooking with the inclusion of two independent adjustable temperature zones. This grill is capable of cooking food in different styles, a feature that will surprise many. Easily move this grill from one spot to another as you can collapse the stand and fold the wheels. The porcelain coating on grates don’t just allow faster cooking of meals, but also ensures faster cleaning. A portable grill that can be taken on picnics, tailgating trips, and RV camping. A decent cooking space of 225 square inches allows the cooking of multiple meals at a time. The grill doesn’t get messy during the cooking process. You can easily clean the grease as it accumulates in one place. Even if you turn the heat on one burner, you will feel the heat on the other burner. Shouldn’t be used indoors as it produces poisonous carbon monoxide. If you want a grill that looks good and works well, then put your money in Giantex Portable Propane Gas Grill. It is packed with some incredible features, which certainly will make the cooking process easier. From quality stainless steel construction to built-in thermometer and from grilling net to carrying handles, the company has taken care of every aspect, as if they have asked the people before manufacturing this grill. A solid stainless steel construction that gives a beautiful look to the unit and assures the users of its longevity. A cooking area of about 290 square inches in a portable propane grill may come as a big surprise to many, but this is how large the cooking area. The heat capacity of the unit is 12,000 BTUs, which is decent if not excellent. You can expect this unit to grill delicious steaks for you within a few minutes’ time. This grill comes with a built-in thermometer, so you don’t have to buy one in order to check the grill temperature in order to prevent the food from being ruined. Moreover, you can rest assured of the quality of food every single time. Moving this machine is anything but arduous, as its lock design makes it easy for users to carry and transport the unit without putting any damage to the grill burner. The inclusion of two coated grilling nets ensures the safety of the users while they are working on the grill. The company has provided hose and valve in the package so you don’t have to buy these separately. On most occasions, people end up buying wrong parts, which could lead to all sorts of troubles at the time of cooking. To prevent food from getting overcooked, a thermometer has been provided by the company. To ensure your safety and healthy BBQ, you will get two coated grilling nets to cover food items once they are cooked. A cooking space of 290 square inches can easily cook food for 6-8 persons at a time. Push-and-turn ignition burners make cooking a lot easier. Lockable lid and handles make moving this grill from one place to another easy. Cleaning up this grill could be a daunting task. Even though you are buying a small sized propane grill, you still have to be very careful because one wrong decision and you will have a wrong machine to play with. Let’s discuss some important factors that you need to keep in mind while buying a small propane grill. Make sure the grill you have chosen comes from the house of a top brand. A lot of counterfeit appliances are propagating in the market, so take your time while making a purchase, and only opt for a branded product. Arguably, the most important parameter while making purchasing decisions, but it shouldn’t be the only parameter for judging a product. Take a look at the build quality of the product, features and overall functionality, and if you are fully satisfied with it, then go for it even if it is slightly out of your budget. Does size matter? Well, in this case, it surely does. The reason you are going for a small propane grill is that you don’t have enough space to accommodate a large-sized grill. So, pay a close attention towards the size of the grill to check whether it is going to fit the area you have chosen for it or not. Check all the features and functions of the grill carefully and match them with your list of requirements. If the grill tick marks all the points that are on your requirements’ list, then that’s the grill you should be investing in. As you are going to be playing with fire, you want your grill to provide you with a safe platform. The grill needs to be properly insulated. It should have the resilience to withstand climate changes. You need to check whether the handles of the grill gets hot during cooking or not. If they are, just move onto the next machine, as you don’t want your hands smoked, do you! When buying a small propane grill, the idea of transportation is always there because what the use of a small, hand-held product is when you can’t carry it along. A grill that has collapsible parts and wheels is always easy to carry, given that the assembling is easy too. After going through the review, I’m sure you must be feeling that I’ve got space to accommodate one of the aforementioned grills. If that is what you are thinking, then yes, you can go ahead and buy the best small propane grill for your BBQ adventure. You are going to love grilling your favorite meals on a small propane grill, plus you can take it along with you on picnics, camping trips, and outdoor parties.